Kinneret still measures 2.2 inches below lower red line. The Kinneret (Sea of Galilee) on Sunday morning measured 698.8 feet and 2.2 inches (213 meters and 5.5 centimeters) below sea level. Since Thursday, the Kinneret rose a centimeter and a half, and currently stands at 2.2 inches (5.5 centimeters) below the lower red line. This is the first time in the past decade when the Kinneret measured below the lower red line at the end of winter. The low levels are due to a combination of especially arid weather and extensive use by Lebanon and Syria of the ground water which flows into the Jordan River and into the Kinneret. Recently, the Water Authority published a report stating February 2017 was an arid month in all of Israel, and some water stations had reached a new deficit of water, unprecedented since the 1920s. 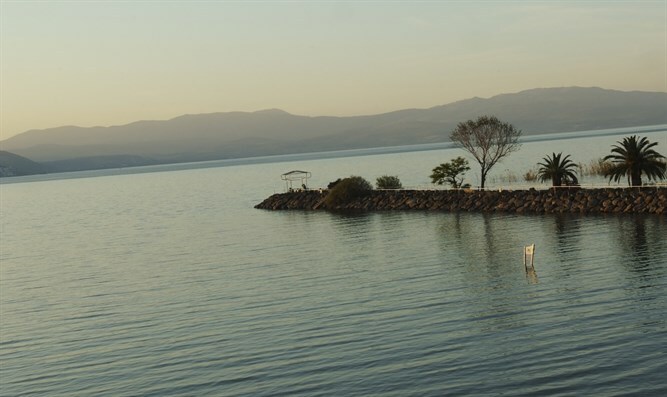 This is the fourth winter in a row in which the Water Authority has ordered an almost complete halt to drawing water from the Kinneret. The Kinneret itself is below both red lines, and Israel's entire north is suffering from a drought, which is expected to worsen during the coming summer.